Sankritilaya is pleased to announce a Spring 2010 vocal concert tour by Prince Rama Varma (Aswathi Thirunal) accompanied by S. Varadarajan on the violin and by Patri Satishkumar on the mridangam. We will be posting the full schedule of concerts in the near future. Rama Varma, a scion of the Tra vancore Royal Family, born in Kerala is a direct descendent of Maharaja Swathi Thirunal, the famous composer-king and perhaps the greatest multi-lingual composer and musician of 19th century, and Raja Ravi Varma, the greatest artist-painter of his time. Prince Rama Varma (“Prince”) is often described as 'Prince among musicians and a Musician among Princes'. He is a post graduate in Commerce. His early exposure to music came from the performances he used to watch at the Navarathri Mandapam (Theater of Navarathri Festival at his Royal Palace) as a child. The Prince started receiving music lessons from Prof. Vechoor Harihara Subhramania Iyer in 1983. Shortly after, he started learning Veena (the majestic string instrument) under Trivandrum R Venkataraman for 5 years and continued his lessons under the tutelage of Sangeetha Kalanidhi Prof. K S Narayanaswamy for another 10 years. After the demise of Prof. Iyer, he became a disciple of musician, Sangeetha Kalanidhi Dr.Mangalampalli Balamuralikrishna, arguably the greatest living Carnatic vocalist, since 1994. The Prince is now one of his prime disciples. Rama Varma gave his maiden public performance in 1990. 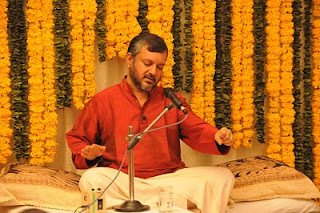 He has performed vocal and Veena concerts all over India and in Europe, Middle East and the USA . He has performed at various venues in Europe, including the Queen Elizabeth Hall, London, the Tropentheater, and the Korzo Theater, Netherlands. For many years he had associated with the Rotterdam Conservatory of Music offering vocal classes in Indian Classical Music and also voice training sessions. He frequently gives lecture demonstrations in South Indian Classical Music particularly on Dr. Mangalampalli Balamuralikrishna's compositions. Varma is regarded as an expert authority in the compositions by both Maharaja Swathi Thirunal Rama Varma and Dr. M. Balamuralikrisha. He has a repertoire of Swathi compositions which is unmatched by anyone else. He regularly contributes articles on Indian Music to news papers like The Hindu and others. 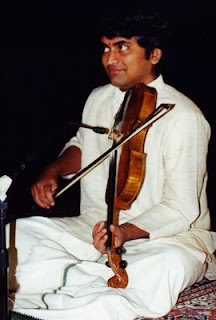 Another violin legend-in-the-making, Santhanam Varadarajan initially learnt violin under Kanchi Janardhanam. He later learnt from the multi-faceted genius T.V. Gopalakrishnan. At a very young age Varadarajan has accompanied many leading artists of Carnatic music and has established himself as a front ranking musician. His style of play is characterized by excellent control over the instrument with brilliant repartees that inspire the main artiste. He has been conferred with several titles and awards and has, for more than 20 years, given solo concerts and traveled the world on several concert tours as an accompanying artist. 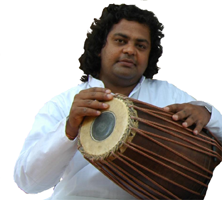 is one of the most sought-after Mridangam percussion artists. His gurus are some of the great Mridangam artists - Sri Ramachandramurthy, Sri V.A.Swami and Sri V.Narasimhan. Satish was inspired into the world of Percussion right from childhood by his mother Padmavathy, a renowned violinist. He played his first concert at the young age of 7. An exponent of Classical, Fusion and Jazz percussion, he is a very innovative artist and has played in many international festivals. Satish has played many recordings with different melodic instruments from India and the West and has also conceived a special Laya Vinyasam (a cascade of rhythms) titled ‘Dancing Drums’. An integral part of the Percussion department of A.I.R (National Radio of India), Satish Kumar has regaled audiences all over the world. His most recent tour of the USA was in Fall 2009. How about a tour schedule? Instead of posting as "Anonymous" we would appreciate names in the comments! Thank you very much for arranging this. It has been such a treat. The trio were just amazing and their stage presence and chemistry unmatchable. Have heard about Varma garu's humility and friendliness but have seen it first hand today. Hope he comes early next time and doesn't wait for 16 more years :) Smt Jayashree garu very aptly said in the vote of thanks - we transcended from the world of body, mind and intellect. Thanks to all! I should really thank you for arranging this tour of Shri Rama Varma. I was lucky enough to attend 3 concerts in this tour. I have been a big fan and till now I had been to only one of Varmaji's live concerts. Later, I learnt about the amount of hard work you both had to put in, apart from the monetary expenses, to organize such an extensive program. Rasikas all over US would be thankful to you for having brought Varmaji here. I hope you continue your good work, and bring sincere, good hearted artists to US. I also (selfishly) hope that you manage to bring Varmaji more often to US.